Nikola Tesla STEM High School in Redmond, WA, opened as the first STEM school in the Lake Washington School District. 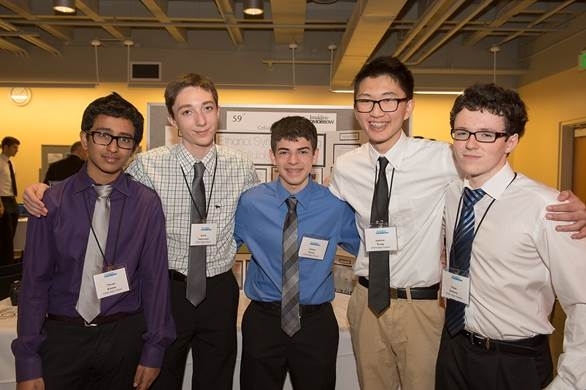 One of the hallmark components of our curriculum is heavy integration with competitions, internships, mentors, and real-world problem solving. Emphasis on these begins in sophomore year, concurrent with our introduction to AP classes and a real outlook on global engineering problems. 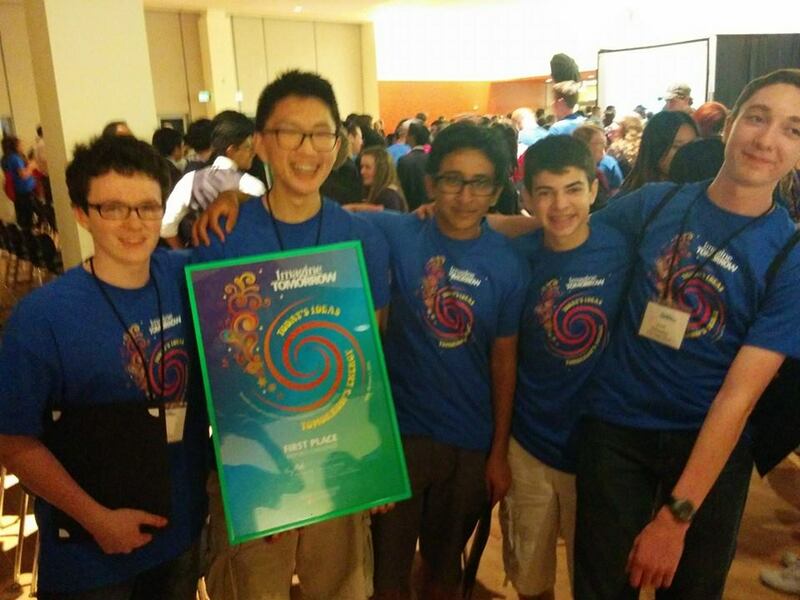 Imagine Tomorrow at WSU is one of the competitions Tesla STEM competes heavily in each June, to date taking home prizes in excess of $60,000. 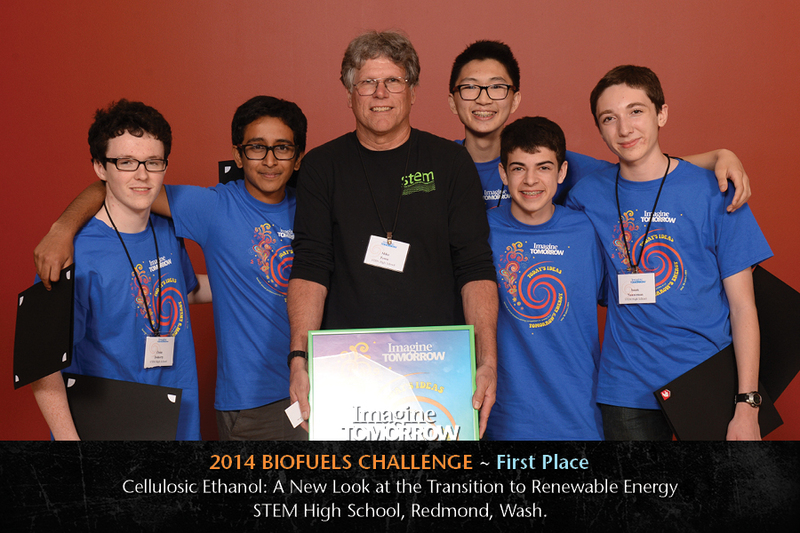 Between my four team members and I, our project entered into the biofuels category placed first place overall and an all expense-paid trip to the Biomass 2014 conference in Washington DC. Published in the Tesla STEM Journal, 2013-2014 Edition. Department of Energy article and video. Imagine Tomorrow 1st place prize. The staggering percentage of consumable crops in the United States that is used for ethanol production is unprecedente by the percentage of waste it leaves. The goal of our research is to develop a more efficient and more cost effective way of synthesizing ethanol from consumable crops or other cellulosic organisms. The transportation industry around the world has historically relied on the use of fossil fuels to power the combustion engine. However, in recent years, the use of alternative fuels such as electricity and biofuels has been on the rise, the most prevalent of which is ethanol. Ethanol is currently used as an additive to the traditional fossil fuels in order to reduce total petroleum usage. In fact, developing countries are beginning to establish a certain percent mandatory ethanol blending for all petroleum fuels. For example, India has put in place a 5 percent mandatory ethanol blending for all petroleum fuels. It is extremely common in the US to find gas pumps labeled with E10 or E15, indicating ethanol content of 10 or 15 percent respectively; some pumps will even dispense E85. It is clear that the world is moving towards the use of more fuels alternative to petroleum and fossil fuels, but there are a number of challenges yet to be solved to further the transition. For ethanol and alcohol-based fuels, the massive amounts of waste left over from production needs to be addressed. Normal aspects of human activity are dependent on the use of multiple forms and sources of energy. In fact, there is a correlation between economic development and increases in energy usage and demand. Uses of energy can be categorized under four general categories: industrial, commercial, residential, and transportation. Together, these four forms of energy currently rely heavily on fossil fuels, but with the rising cost of oil and its environmentally damaging factors, there is an urgent need for a replacement for the energy source that provides the world with 87.1 percent of its electricity. Transportation dominates the world's demand for energy. Worldwide, transportation accounts for 25 percent of the world's energy demand and 61.5 percent of all the oil used each year. With alternative sources of fuel on the rise, there is a need for cleaner and cheaper methods of alternative fuel synthesis. Chemically speaking, ethanol is a colorless liquid formulated by the structure CH3CH2OH that is flammable, volatile, and soluble in water. Ethanol first became prevalent as a fuel as early as the 1840s, but high taxes on alcohol during the Civil War made ethanol uneconomical in the United States. Repeal of the tax in 1906 shifted ethanol back into the transportation industry; the Ford Model T was built to run both on petroluem and ethanol. In recent years, it's use as a fuel additive for internal combustion engines has ignited across the globe. Production of ethanol from feedstock was one of man's first ventures into the concept of value-added processing. Although the same general steps have remained in industry today, companies have been looking for ways to decrease fossil energy dependence while manufacturing ethanol. The process of manufacturing ethanol can be seen in this figure by the Renewable Fuel Association. Although shifts towards ethanol and away from complete dependence on fossil fuels is beneficial, the amount of energy and waste involved yin the current process limits the growth of ethanol as a transportation powerhouse. Corn is the most prevalent crop used in processing bioethanol. In a normal case of corn ethanol production, majority of the corn stalk, fruit, and husk are not used for the final fuel product, but instead discarded as waste or sometimes used as a biproduct for the feed or insulation industries. Only the glucose-rich juices from the corn kernels are used for ethanol synthesis, leaving most of the cellulose-based materials of the plant almost completely untouched and underutilized. Further, the processes beyond extraction of the glucose, cooking and liquefaction, require massive amounts of energy. Recently there have been developments in the ethanol processing industry that allows for the processing of ethanol from the remaining cellulosic plant material in addition to the traditional glucose method, but requires even more energy and complex chemical treatments that drive up the cost. The goal of our research is to genetically modify yeast such that it contains a family of enzymes known as cellulases. Cellulase is an enzyme commonly found in the stomachs of animals that consume cellulosic organisms, such as a cow or grazing animal whose diet is composed of primarily fibrous plant material. The introduction of this enzyme to yeast will allow it to consume the cellulosic material and use the energy gained for the production and excretion of alcohol. Yeast consumes glucose and excretes alcohol as a byproduct. Yeast is ideal for our experiment because our goal is to create ethanol with little to no energy input beyond the necessary thermal and environmental conditions. So, the use of yeast’s natural process will allow for ethanol production with minimal input of fossil energy. The only cases of naturally occurring cellulolytic yeast have been found in pond water in Japan. However, in order to make this process cost effective and to satisfy society’s desire for minimal foreign dependency, cellulolytic yeast needs to be able to be produced in the U.S. through the process of genetic modification. What this will allow the yeast to do is consume the cellulose of cellulose-based organisms and excrete alcohols (such as ethanol or isobutanol/propanol) as a byproduct. If the product of our experiment works as intended, then the process of collecting alcohol for fermentation and distillation will require vastly less energy and processing after the yeast is manufactured. Ideally, the product of our experiment will replace the current method of producing ethanol. Our product will greatly reduce the use of fossil energy currently required to make ethanol and allow ethanol to enter the energy sector as a greener and cheaper source of alternative energy. We hope that the product of our experiment will help transition the world to cleaner, greener, and sustainable energy sources. International Energy Outlook 2013 [Internet]. 2013 Jul 25. 2013 Edition. Washington (DC):U.S. Energy Information Administration; [2013 Sep 16, cited 21 Dec 2013] . How Ethanol is Made [Internet]. Washington (DC):Renewable Fuels Association; [cited 2013 Dec 21] . Greenhouse Gas Emissions: Transportation Sector Emissions [Internet]. Washington (DC):Environmental Protection Agency; [2013 Sep 9, cited 2013 Dec 21] . Good D. 2013 Nov 12. Corn Used for Ethanol Production [Internet]. Urbana (IL):University of Illinois; [12 Nov 2013, cited 2013 Dec 21] . Ethanol Fuel Basics [Internet]. Washington (DC):U.S. Department of Energy; [2014 J an 17, cited 2014 Jan 25] .